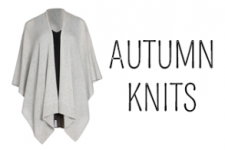 One of the best things about the cooler months is bundling up in delicious warm snuggly knits. That feeling of being nice and cosy when there is a chill in the air? Perfection! These cocoon and wrap cardigans are the crème de la crème of cool weather snuggly clothing – the draped front is so perfect for wrapping around you and cuddling in to on a particularly chilly day. That cocoon cardigan is coming home with me quick smart, so you can expect to see me snuggled up in it soon. Cashmere makes a gorgeous luxe knit that’s like snuggling into the softest of embraces. I especially love the pastel shades at EziBuy at the moment, they’re a great way to soften the black on black that I gravitate towards when it gets cold. Make sure you check out Cait’s guide to taking care of your cashmere here. Tunic style tops are great for autumn – wear them with ponte pants or your favourite jeans and a killer pair of boots for a casual weekend look. There are some super cute styles in light knits that are a wee step away from what we’re used to this season – my favourite is this layered knit that looks like a crop with a silky chiffon trim. It’s perfect with boyfriend style jeans and sneakers for long meandering walks. How do you wear your knits?